1. What do you know about plantar fasciitis? 1.1. What is plantar fasciitis? 1.2. What are symptoms that prove you suffer plantar fasciitis? 1.3. How to diagnose plantar fasciitis? 2. Are essential oils for plantar fasciitis effective? 3. Which are the best essential oils for plantar fasciitis? 4. How to apply essential oils for plantar fasciitis? While some choose to massage, heat, rest or stretch their heel, the others look for natural remedies that might help to manage their plantar fasciitis. The truth is that using essential oils for plantar fasciitis is one of the traditional treatments that won’t bring any side effect. Moreover, it’s known as a miracle to restore your feet effectively. Before going into the details of which essential oils are the best, why don’t you update more necessary information about this common foot condition first? What do you know about plantar fasciitis? The plantar fascia is the joining band of tissue (ligament) that links your toes to the heel bone. And its main task is to support your foot’s arch. So, in case the fascia is tense, it becomes weak, swollen, irritated and then make your heel or your foot’s bottom hurt when walking or standing . And this symptom is called plantar fasciitis. It mainly occurs among the elderly; however, it also happens in younger people who have to be on their foot a lot. The plantar fasciitis can be created by a variety of reasons, particularly by the numerous and repeated strain. Below are some usual causes that might lead this condition. What are symptoms that prove you suffer plantar fasciitis? When taking first steps after sitting for a long time or getting out of bed, if you feel a pain or have less stiffness, that means you are suffering the plantar fasciitis. And your foot might hurt more as the day continues. Even, this pain becomes worse when you stand with weight on toes or climb stairs. How to diagnose plantar fasciitis? The best way is to visit a reliable doctor or medical professional so that they can diagnose your symptoms. Normally, they will examine your feet and see how you walk, stand and sit. Besides, they might ask you some questions such as your previous illness, when your foot gets hurt, what kind of physical activity you perform, etc. Then they might suggest an X-ray of your foot if having any doubts about your foot bones. Are essential oils for plantar fasciitis effective? Although it seems that there is no actual research to support the use of essential oils for plantar fasciitis, you easily find out lots of good news. For instance, German researchers pointed out that Boswellic acid in frankincense can interrupt the inflammatory process and help to decrease the inflammatory reactions . So, if you’re suffering from heel pain and want to use this treatment, just try. As long as you remember to dissolve it before using in order to avoid some unnecessary side effects such as rashes or allergic reactions. Although the essential oils are not proven to heal plantar fasciitis, its potential benefits, particularly the natural anti-inflammatory properties, can help you. Besides, it comes with a pleasant smell so that you can use not only on your feet but also in a diffuser to feel better. And when you recognize tranquility and relief from these essential oils, feel free to avail them by all means. Which are the best essential oils for plantar fasciitis? It’s certainly tough to pick up the most suitable product while you’re being surrounded by dozens of essential oils for plantar fasciitis available on the market. Since you’re here to get a miracle for your heel, please allow us to introduce a list of the best ones which are judged from their popularity. Extracted from 100% Boswellia tree species, Living Pure Frankincense boasts its 100% natural essential oil with no additives, toxins, and filters. With a powerful balsamic, sweet, wood and distinct scent, this product can be used in different manners via applying topically or adding to tonics. Through many years, scientists and researchers have pointed out that the frankincense is one of the best essential oils for plantar fasciitis thanks to its anti-inflammatory, analgesic and cicatrizant properties. According to a study, a group of patients who were suffering the chronic heel pain was given the frankincense essential oil. After that, these patients reported a better range of movement, improved their knee motion, and increased capacity to walk for a longer distance. So, if you’re going to use the Living Pure Frankincense for treating the plantar fasciitis, remember to mix it with a carrier oil such as jojoba oil and then massage into your heel. Aside from excellent healing effects, this product can be availed for aromatherapy, improving relaxation, decreasing the appearance of scars, and promoting the skin. Wintergreen has been used as a cure for aching and sore joints by the traditional Native Americans for a long time. Thanks to its therapeutic elements (especially 99% methyl salicylate), wintergreen is perfect for removing discomfort from aging muscles. Harvested from the superior ingredients in the world and combined with the best distillation and bottling process, the wintergreen essential oil from Healing Solutions boasts their products are aromatically excellent and effective. And you’re guaranteed to get a refund if feeling unsatisfied. Researchers pointed out that this essential oil has a capacity to act as an analgesic (a natural pain reducer) which is the major reason for dealing with plantar fasciitis effectively. In addition, the wintergreen includes sedative and anti-inflammatory properties that are useful for managing any foot issues. To get the best results, you need to use 2 times every day. Try mixing the wintergreen oil with Epsom salt, baking soda, and warm water in a large basin. Then soak your feet about 15 minutes and relax. For those who first use the essential oils for plantar fasciitis, this product might be a nice choice since it brings a nice scent. Among the essential oils for plantar fasciitis, the peppermint is known one of the most popular essential oils that most people have in their medicine chest. 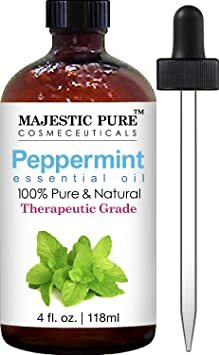 With its perfect anti-inflammatory, menthol, and analgesic properties, the peppermint oil can offer a calm and cool sensation that can help you alleviate the sore muscles. It’s also useful for stopping the pain at night that often happens due to plantar fasciitis. Extracted from Mentha Piperita’s flowers, buds, and leaves, the majestic pure peppermint essential oil gives you a fresh, menthol and sharp scent. With analgesic effects and a mild stimulant quality, this product helps to handle different symptoms of foot conditions via penetrating into the skin quickly to lessen the pain and warm the skin to enhance tissue repair and blood circulation. And if you are suffering the fasciitis pain every night, this peppermint oil will be a nice remedy to make you get a good sleep. Just dilute it with a carrier oil as almond or coconut oil and then relish a therapeutic massage. Or you can add some drops to your diffuser or on a pillow before sleeping. Birches are lovely shade trees that mainly grow in the northern hemisphere. And you can easily recognize a familiar scent from this oil at your grandparents’ house. As compared to other essential oils for plantar fasciitis, the Eden Gardens Birch Essential Oil is quite well-known thanks to its detoxifying properties. Besides, this oil combats with inflammation efficiently for any kind of foot condition. What’s more, it helps to maintain a wholesome circulatory system. Since this product affirms 100% pure birch oil, you’re guaranteed to receive no herbicides, additives, pesticides, and GMO. But, in case you want to test and see how effective and comfortable it is, try picking up the 10-ml bottle. When applying some drops on the heels, the Eden Gardens Birch Essential Oil instantly manages discomforts relating to the plantar fasciitis. Except for fighting against the foot troubles, this essential oil boasts its versatility for supporting those with super-active lifestyles and seniors. Just make sure you follow necessary recommendations seriously. For instance, never use if you’re breastfeeding or pregnant. Or don’t use for children or when you’re suffering blood thinner. The lemongrass essential oil from Sun Organic is one of the best essential oils for plantar fasciitis that can easily satisfy anyone. Extracted through the distillation of dried lemongrass, this essential oil smells like lemons, yet sweeter, milder and less sour. This product holds excellent analgesics and anti-inflammatory properties that help to lessen pain and inflammation. Besides, it alleviates pain in joints and muscles as well as healing general body pain from taxing activities and athletics. Especially, using the lemongrass essential oil helps to boost mental strength, confidence, self-esteem as well as increasing spirits and lessening depression. Just remember that once using it, the best thing is to combine with a carrier oil such as jojoba or almond oil because the lemongrass oil might smell quite strong. 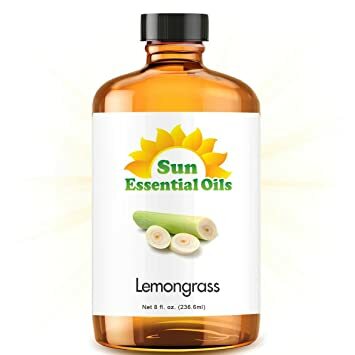 Whether you’re suffering plantar fasciitis or any problems related to health, we believe that the Sun Organic Lemongrass Essential Oil can help you solve well due to its excellent medical properties. When making a mention of the top essential oils for plantar fasciitis, the black pepper oil seems not to be popular. However, those who used to try this oil agree that it brings lots of satisfying results. 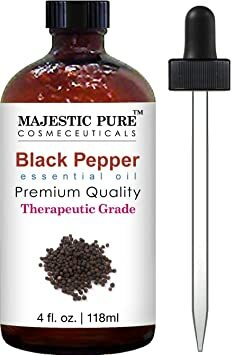 And the Majestic Pure Black Pepper Oil boasts a natural and pure essential oil that can help you treat pain from worn-out muscles and aging. Owning both anti-inflammatory and antispasmodic properties, the black pepper essential oil can deal with plantar fasciitis effectively as well as giving a refreshing effect to any foot conditions. Moreover, this common herb is known as a helpful solution for jogger heels. When applying the oil topically, it might make your skin red via creating the capillaries’ dilation and enhancing blood flow, helping to alleviate chronic and sharp pain. As a dancer or athletes, using the black pepper essential oil to massage muscles before and after performing is extremely useful because it stops pain and stiffness. It’s best to test on your elbow area first to see any allergic reactions before using. For aromatherapy, you just add a few drops in the diffuser and then enjoy a pleasant pepper-ish aroma that is quite sharp yet subtle. Known as one of the best aromatherapy essential oils, marjoram is popular for calming you from the pain of the heels. Thanks to the excellent antispasmodic and anti-inflammatory properties, it can effectively remove the sore muscles. Plus, its slightly medicinal and herbaceous scent helps to ease excess fluid in tissues and act as an antidote. When you’re in search of the best essential oils for plantar fasciitis, NOW Solutions is one of the most popular brands that you shouldn’t miss. Try looking at its premium quality Marjoram Essential Oil that is well-known for its perfect healing properties. This product boasts its 100% pure and natural oil that is steam-distilled from the flowers and leaves of Thymus mastichina. With a sweet aroma, you are able to dilute this oil with any carrier oil like olive, almond, jojoba, or grapeseed oil. In addition, you can mix it well with basil oil, thyme oil, rosemary oil, and clary sage oil. However, you should consult some safety information to receive the best benefits from the marjoram oil. Of course, don’t use when you’re pregnant. Or if you’re suffering any depression, avoid availing since it holds a sedative and strong effect. And just utilize an appropriate amount or it might cause drowsiness. Like the others, helichrysum essential oil has been availed by many societies and cultures, dating back to ancient Greece. With a fresh, earthy and herbaceous aroma, this essential oil for plantar fasciitis includes antispasmodic properties that are helpful to stop muscle spasms in your feet. In addition, it’s efficient to deal with fatigue which is caused by numbness and pain. What’s more, if you’re suffering any swollen heel, be free to use it to enhance your body immune and recover comfort. Aside from curing the chronic foot issues, using the helichrysum essential oil reduces lessen wrinkles, stretch marks, and scars. When being applied, it will not only improve the overall appearance of your skin but also permit the blood’s circulation to the area applied in order to enhance and transfer oxygen to the needed parts of your body. Since the helichrysum essential oil can affect both internal and external, you are able to use it for any purpose such as aromatherapy, diffusion, massage, perfume, spa, oil burner, etc. to improve your overall satisfaction and health . 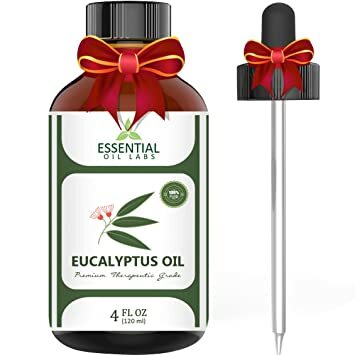 The eucalyptus essential oil from Essential Oil Labs, which is extracted from both leaves and bark of the eucalyptus tree, is known as a perfect anti-inflammatory and healing properties. For this reason, the eucalyptus benefits are worth-knowing. According to a recent study, patients with plantar fasciitis who inhaled the eucalyptus oil for about 30 minutes over 3-4 consecutive days reported a big decrease in pain. Moreover, they had lessened blood pressure after the experiment. To use this essential oil for treating your pain, remember to dilute it with the coconut oil or blend it with rosemary, peppermint, lavender or marjoram oil and then apply directly on your foot. Next, perform a circular motion around your Achilles tendon or even onto your calf muscle to bring the best effect. In addition, the eucalyptus is effective for a daily use because it helps to remove and refresh your body, mind and even your home. Especially, its fresh and stimulating scent also supports you to begin and end every day with a relaxing and positive state. If used in aromatherapy, this product will enhance your feelings of a clear mind and relaxation. That’s why the eucalyptus oil has been always ranked among the top essential oils for plantar fasciitis until now. Rosemary is an aromatic evergreen herb which is originally cultivated in Africa and around the Mediterranean Sea. In the old days, it used mainly for natural remedies, love charms or flavoring. Today, it has been employed in a variety of ways such as aromatherapy, lessening stress, reducing pain in foot, and so on. 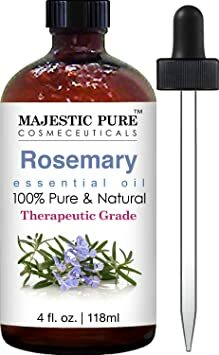 And here is the last among our suggested essential oils for plantar fasciitis, Majestic Pure Rosemary Essential Oil. Extracted from the rosemary plants’ needles via using steam distillation, this product boasts both excellent anti-inflammatory and analgesic properties that are good for those who are suffering heel pain, especially plantar fasciitis. This oil helps to ease muscle and joint pain as well. The rosemary essential oil can be applied directly without diluting. Though it’s recommended to dilute with a carrier oil such as fractionated coconut oil or jojoba oil to help your overall health and pain relief better. Especially, you should notice that this oil can be unpromising for your pets at certain focuses. So, it’s best to keep out their reach. How to apply essential oils for plantar fasciitis? After knowing different properties in the essential oils for plantar fasciitis above, you should learn some ways to use it accurately and effectively as well. One of the simplest methods is to apply the oil directly on the affected area so that it can absorb into the skin, muscles, and tendons. And now, we will show you three easy ways to follow. You can perform this relaxing method every day, preferably before going to bed, in order to get rid of the plantar fasciitis. Let’s prepare a tub with warm water and mix it with ¾ cup Epsom salts. Then add 10-20 drops of different essential oils that you’ve bought. We suggest that you should try blending the birch, peppermint, and marjoram oils together. Next, soak your feet in this mixture for 15 minutes to enjoy the benefits from the essential oils for plantar fasciitis. Remember to do 1-2 times per day and combine with a regimen of foot rolls, stretches or yoga techniques to increase the efficiency. Try mixing some potent essential oils into an amber bottle including helichrysum, lemongrass, black pepper, and wintergreen or any oil you want. And you need to dilute it before massing directly on your foot. With this method, you can use the above mixture and blend it with coconut oil in a bowl. Then put your fingers into the bowl and start rubbing the oil into your soles in order to warm them up. Next, use your thumbs to press your feet and the rest of fingers. And don’t forget to avail your knuckles to knead your soles. In case you feel too much pain, stop doing. It’s best to ask for your partner’s support or use massaging tools to apply focused pressure to the soles better. Always put your safety first. Find out whether you might get any bad reaction from using these oils directly on your skin. Test the oil mixed with the carrier oil on a small area on your skin and wait for hours to permit it to penetrate into your pores. If any reaction happens, instantly apply more carrier oil. Don’t remove the oil with water or you might cause extra reactions. Bear in mind to dilute the oil with the carrier oil to active its benefits better. 1 drop of essential oil with 8-10 drops of carrier oil is ideal. Avoid heating up the essential oils because they can burn. Just rub the oil in your hands before applying to the feet and then you will feel the warmth. Most of the essential oils are for external use, except some. The best thing is to check it carefully before using. Now, treating the chronic heel pain known as plantar fasciitis is not difficult as imaged. With the top 10 essential oils for plantar fasciitis, we believe that you can receive the best results no matter which product you decide to opt for. Besides, don’t forget to combine these oils with other necessary remedies like performing foot rolls and stretches, wearing the appropriate shoes for plantar fasciitis, availing a foot massager and eliminating some extra pounds. Last but not least, you need to use these essential oils continuously for a few months or until your inflammation and pain leave permanently. Since we prefer to engage with readers, you’re welcomed to leave any thoughts, questions, and comments in the box below if you still want to know more about the pain relief for your plantar fasciitis. We’re always here to support you.